Mike Isabella’s Kapnos Taverna in College Park serves classic and coastal-inspired Greek dishes, including favorites from the Greek Islands along with tastes from other regions known for their fine local products. 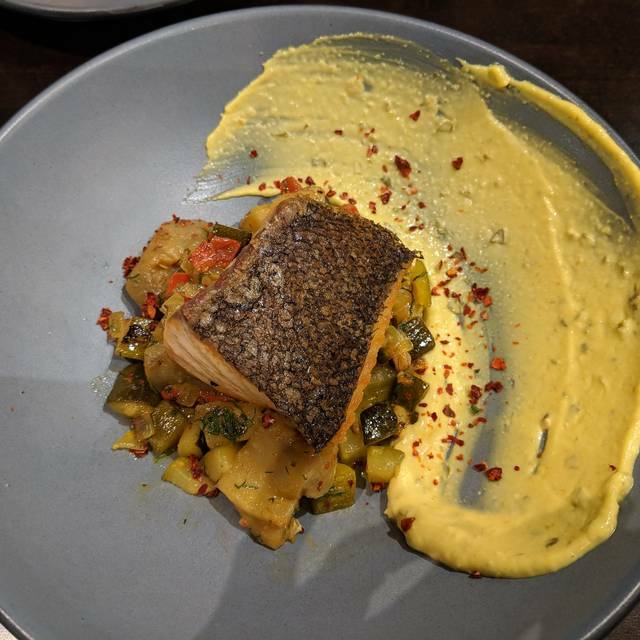 A sister restaurant to Isabella’s Kapnos, located on 14th Street in Washington, D.C., Kapnos Taverna College Park fatures more traditional takes on the ancient cuisine alongside some of the biggest hits from his modern ode to mainland Greece. The restaurant’s liquid offerings feature a Greek-heavy wine list and Mediterranean-inspired cocktails. All night Happy Hour at the bar every Monday and Tuesday night! The Hotel at the University of Maryland offer valet. You may also park in the hotel parking garage. College Park - U of MD stop on the Metro Green line. 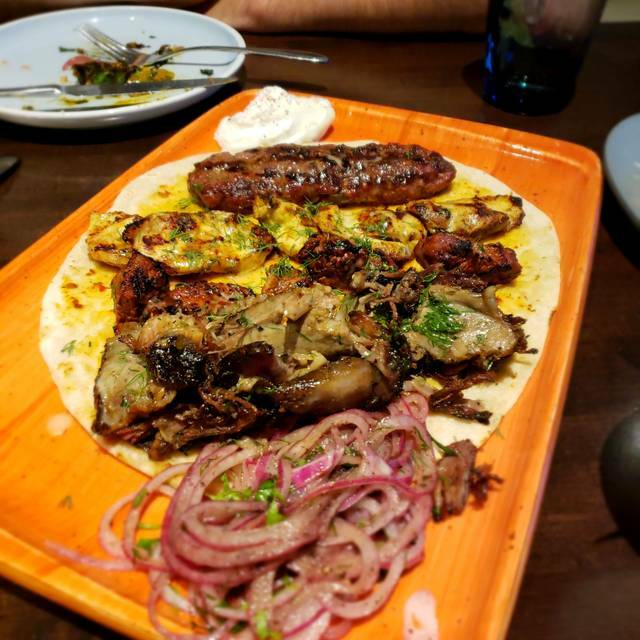 We've eaten at Kapnos several times and have never been disappointed. There is ample food if you order several dishes. We tried the mixed grill and it was more than enough to feed 5 adults. It would be an improvement if they turned off the sound on the TVs since there's music playing anyway. It's sometimes hard to hear people at your table, and no one was watching the sports anyway. We loved getting little plates of food to share, and the food was great. It is an excellent way to try different dishes. The wine we had was also great. I wanted to hear Greek music and enjoy the atmosphere but the had a horrible dinner experience. The “grilled plate”came burned and there was just burned meat and no side dish....For me was first and last time going there. I been to Greece and Greeks restaurants and this bar is nothing like Greeks eat. The only “Greek”things was the name. Very disappointed and won’t recommend this place. I was disappointed in my lunch. Maybe I ordered the wrong thing. The gyro was dry, as well as the ‘shell ‘ it was served in. We had dinner here, and everything went quite well. Our server was attentive and knowledgeable, and the food came out quickly. I especially liked the hummus, and the falafel was crispy and excellent. We had a delicious dinner with friends sharing a number of plates. We went there on a Sunday night and were surprised at how few customers were in the restaurant. I don't know if this is a #MeToo reaction to Mike Isabella, but I really hope that they don't close. We have so few really good restaurants in PG County. Fantastic experience at our first visit, for our anniversary. Our waiter doubled as a bartender and made a super cool and delicious old fashioned and recommended a great wine. Food was amazing—highly recommend mixed grill plate and dip sampler. The manager personally ensured we had a memorable celebration and we will absolutely be back. Definitely hard to top this place for a date night in the area! Enjoyed the food immensely. Server was very friendly. Thank you. We were very disappointed with the service and the food. We were not offered drinks or even water for the first 20 minutes we were there, even though it was not busy. We asked for salt for the meal and they never brought it out. They also did not offer us a dessert menu at the end. It was a very disappointing experience overall. Everything we had was delicious from the chicken kebabs to the zucchini fritters. Cocktails were also good. took our large group on short notice with flying colors. Food is excellent and service is quick. However, happy hour is no longer offered on Saturday and Sunday which is a shame because that is the only draw for me to drive to College Park from Silver Spring. Terrific food - fun sharing multiple courses (spreads, salad, fried cauliflower, beef and chicken kabobs). Service from waitress who was a senior at Univ of Maryland was outstanding. Came for dinner and chose happy hour at the bar for tapas. Nice selection of wines during happy hour especially the Syrah. The spicy eggplant is very good however the crispy brussel sprouts or phenomenal! Excellent restaurant with great Greek food and nice service! Free parking at the hotel when you get your ticket validated at the restaurant! Good service as well! Had the express lunch and chose the lamb gyro with mixed greens. Everything was delicious. Will definitely return. This was an excellent meal. Thank you to the chef, the hostess, and the servers for making this a wonderful experience— especially for the special request on the birthday dessert. I highly recommend! We ordered the mix grill and a Greek salad to share. Food had good flavor. We also ordered octopus and crispy eggplant as an appetizers, both were good. This was the first time we'd ever eaten at Kapnos Taverna in College Park--and we will definitely go back!!! What a hidden treasure! First, we were surprised by the very upscale hotel lobby we walked across to get to this very presentable, rustic but modern restaurant. Second, we love that KT validated our parking ticket for free parking! Third, I spoke with our waitress Ms. Hayes about previous reviews I read on lack of water refills. And she proved to be very responsive and knowledgeable. She regularly stopped by to see that our water glasses were filled and if we needed anything. Fourth, we thoroughly enjoyed the appetizer Ms. Hayes recommended (4 zucchini patties with black pepper yogurt). They were simply delicious--and so different from anything we've tasted before. Fifth, we enjoyed the whole-fish bronzini which was cooked to perfection, crispy on the outside, juicy tender inside, and minimal bones for structure. The dish, which we split, was served with unique tangy sides of herbs and mashed potatoes. Though, one person could easily eat the whole dish. Next we split the 4 beef kabobs accompanied by a bright medley of diced vegetables. So good! The only negative comments we had were no bread of any kind was brought to the table. Though, one could order pita or some other Greek bread with hummas, and the bathroom trash overflowed. We both found the food quite tasty, & the service was excellent. The menu is somewhat limited, but we both found items we liked. The only negative was something in the food triggered my wife's reaction in which her ankles swell up. Options for Restaurant Week were Delish!!!! Second time going for work lunch and never disappoints! so excited - we got there to find a Restaurant Week menu! Great selections and service was really good. It was a perfect night to sit outside. The service outside was a little slow but the food was amazing. Excellent as always!! Brussels and cauliflower are the best as well as the eggplant dip melitzanosalata and the mixed grill plate to get a bit of everything. Excellent so happy we came. I generally never write a review however was severely disappointed with the meal. They ran out of tomatoes which seemed awfully strange for a Greek restaurant. Not in a rush to go back. Food was great. It was too cold to eat inside, so we had a lovely meal on the patio overlooking the campus. Shrimp, spreads (with cucumber sticks! ), and salmon were all great and well presented. We decided to try this restaurant during DMV Restaurant Week, and what a great choice. From the sauces, mezze and dessert, it was absolutely wonderful! The ambiance was great! The service was impeccable. The food was so delicious and well seasoned. I had the eggplant sauce with cucumber sticks. 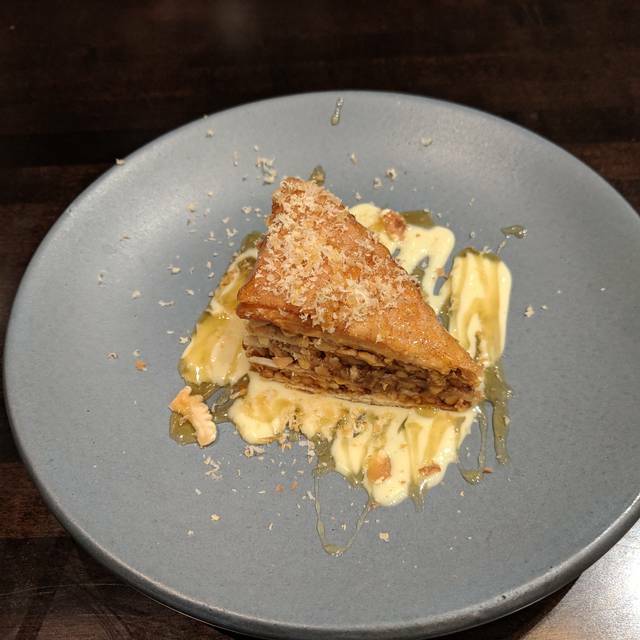 I had the salmon with eggplant and for dessert the Baklava. My husband had the spicy feta sauce and the lamb - Delicious! Everything was extraordinary! And they offer free parking for 3 hours if you park in the garage. We will definitely go back. The restaurant had a great atmosphere for a lunch date. It was my first time at Kapnos Taverna. 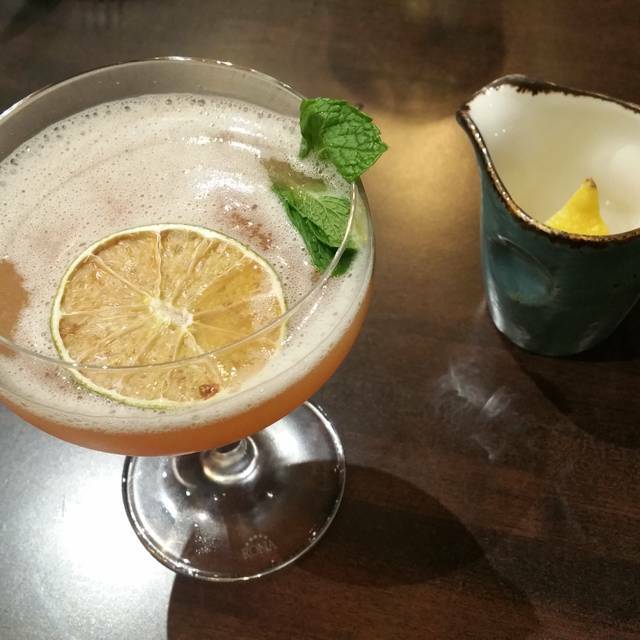 The atmosphere was lively, the food was very tasty and the service was excellent! Since I’m gluten free and dairy light, I really appreciated the gluten and dairy free menus. Plus, our server explained how gluten items could be altered to eliminate gluten. Very nice indeed! I am a bit disappointed. I am a resident of the area and unfortunately, we do not have a lot of places where we - professionals - can hang out and have a nice glass of wine and good food and avoid the cheap chains! Kapnos could be that place! Good food and good list of drinks/wines. However, it requires to close later than 9pm. A restaurant that closes at 9pm in the summer is the antithesis to Summer :) Other than this, the waiters were extremely nice and friendly and knowledgeable. Another warning, the Hotel parking is free for the first three hours and the ticket validated at Kapnos..I am not sure why there is not sign mentioning this. Enjoy! Had indicated in my reservation that it was a special birthday and reminded the host who seated us -- but nothing was done at all re the birthday. Oh well. Friends didn't care for the octopus and beef kebab was too spicy for hubby who likes only the mildest of spices. Water offered to let us keep the beef kebab and to bring a milder chicken kebab. Brussels sprouts and saganaki were amazing. Greek salad was also excellent. Sitting outside on a perfect temperature night made the evening truly memorable. Brandt was a very attentive waiter. Went to Kapnos for a romantic birthday dinner. Food was well prepared and presented. They have a wide selection of tapas, as well as some full size plates that are enough to share if you've had a few tapas. Guess the place would probably be livelier during the day, given its proximity to the Univ. of Maryland. Service was good, about what we expected. The choices were innovative, different from the usual Greek fare. Definitely worth trying. Excellent place for weekend brunch, great variety of food and great atmosphere. Amazing service! The food and drinks were delicious! Was staying at The Hotel at UMD recently and as this restaurant is attached to the hotel decided to dine here. The staff was extremely friendly and the food really blew me away honestly. I've ate at a lot of tapas/small plate spots and this one is truly fantastic. 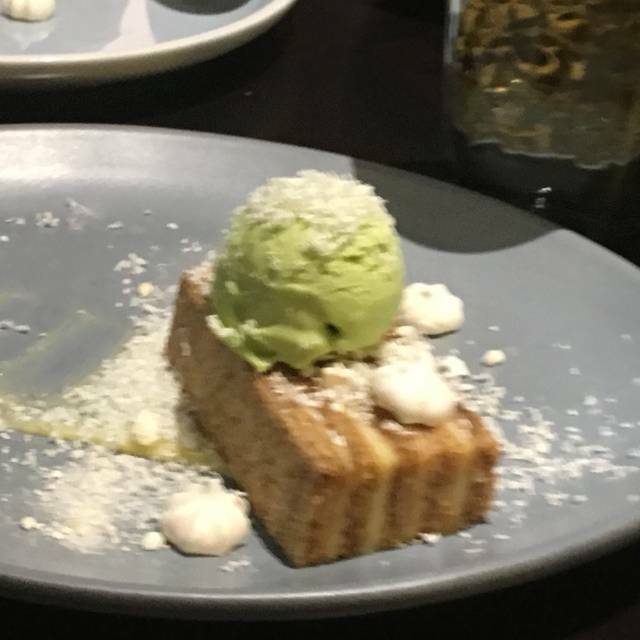 I rounded it all up with the coconut sorbet which was out of this world. I had a drink at the hotel lobby bar that was wonderful while I waited for friends. I highly recommend that. Every one of the mezza was wonderful and we all enjoyed them. The waiter and other staff were attentive and provided good service. The mezza come out as they are ready so that made it possible to manage table space. We would definitely go back again! Great food. Only complaint is the timing of the delivery of the entrees. Waited almost 10 minutes for second two. Well, one other complaint, the seats are uncomfortable. Need cushions. But still well worth going for the food.